Manufacturer of a wide range of products which include packaging machines for food & beverages industry. The most important thing that decides the marketing of a product is its packaging and when it comes to food & beverage packaging, our company has some of the advanced packaging machines in line. In the food & beverage packaging industry, the main emphasis lies on preserving the flavor and quality of the products. 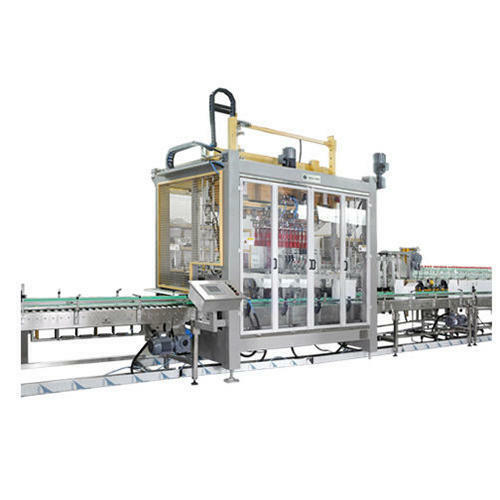 Our entire line of packaging machines is loaded with all the advanced features and operations that meet many requirements, including protection against contamination and desiccation, low environmental pollution, and an appealing packaging design. Food & beverage industry comprises of ample varieties and those varieties require different types of packaging techniques as Beverages needs consistent seal integrity for greater protection against leaks and Dairy products requires to retain freshness and flavor in their packaging to name a few. Keeping all these requirements in mind, we have invented innovative automation concepts for our packaging machines that are capable of supporting multiple food packaging technology requirements superbly. Our entire range of machines is integrated with standardized interfaces that includes clear motion control, reliable allocation, and significantly more flexibility while operation. Food & beverage industry comprises of ample varieties and those varieties require different types of packaging techniques as Beverages needs consistent seal integrity for greater protection against leaks and Dairy products requires to retain freshness and flavor in their packaging to name a few. With extensive research work, we have presented a complete line of Packaging Machines for all the diverse requirements of packaging industry. We have introduced flexibility in the modular automation that makes our company to grow and develop the packaging machines in line with the food packaging technology that has been developing with the time. Our entire range of machines is integrated with standardized interfaces that includes clear motion control, reliable allocation, and significantly more flexibility while operation. We have introduced flexibility in the modular automation that makes our company to grow and develop the packaging machines in line with the food packaging technology that has been developing with the time. Looking for “Beverage Filling Machine”?